Today, Purdue Extension delivers practical, research-based information that transforms lives and livelihoods. Tailored to the needs of Indiana, its programs include: Agriculture and Natural Resources, Health and Human Sciences, Economic and Community Development, and 4-H Youth Development. However, today’s success is built on over a century of visionary hard work and outreach. Imagine Indiana's farms at the turn of the last century. Having a good or bad year could mean the difference between prosperity and your family going hungry. Before farmers abandoned decades of proven practices or adopted new technology, they would have to be convinced that it would work and that using it was in their best interest. Enter county Extension agents, who took up their posts in 1912. Many of the most significant agricultural innovations of the last hundred years were still being developed in the laboratories and experimental fields of land-grant universities like Purdue. Enriching the Hoosier Farm Family: A Photo History of Indiana’s Early County Extension Agents captures the story of the state’s first Extension agents in archival photos and words, when Extension was an idea and county agents were folks who traveled muddy back roads visiting farmers day after day, year after year. Compiled from original county agent records discovered in Purdue University’s Virginia Kelly Karnes Archives and Special Collections Research Center in the Purdue University Libraries, Enriching the Hoosier Farm Family includes hundreds of rare, never-before-published photographs and anecdotal information about how county agents overcame their constituents’ reluctance to change. Through patient outreach and dedicated engagement, they built trust in communities and little by little were able to share new information that introduced farmers and their families to exciting new frontiers of productivity. crucial role that county Extension agents played in transforming the agriculture of Indiana in the early part of the twentieth century. These remarkable images capture the creativity of Extension agents bringing new ideas to rural areas. Additionally, they capture the pride of Indiana farmers and their families as they reap the benefits of those innovative technologies, practices, and record-keeping tools. Anyone interested in midwestern agricultural history and the economic development of rural areas will find this a fascinating and inspirational journey back to a truly transformational time. 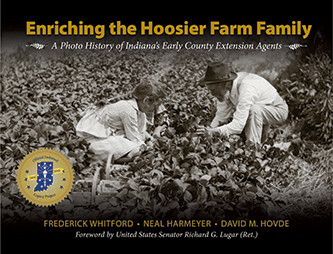 Whitford, Harmeyer, and Hovde have compiled an important pictorial history focusing on the Cooperative Extension Service in Indiana during the 1910s through the 1930s. It is a powerful and moving record that shows the importance of Extension outreach in American agricultural life. This beautiful book really shows the hard work and dedication of our early Extension agents as they built the Cooperative Extension Service in Indiana. What they taught and demonstrated may have changed, but the groundwork they laid built a valuable base for today’s Purdue Extension, which still serves our state and people of all ages. . . . I salute the authors for an outstanding compilation of historical photos that tells the story of early Extension work throughout Indiana. Congratulations are in order for Whitford, Harmeyer, and Hovde, who put together this captivating story of the great history of the Hoosier farm family and how research and Extension helped make farms and families become what they are today. Early county Extension agents understood that the Cooperative Extension Service was progressive for its era. Only by looking back can we truly understand the full measure of all that their diligence and dedication helped to build. With its compelling and comprehensive collection of photographs, Enriching the Hoosier Farm Family provides a fascinating, slice-of-life archive of agricultural accomplishments in Indiana. Through vividly detailed historical writing, Whitford, Harmeyer, and Hovde also evoke the selflessness with which county agents empowered Indiana farmers by personally, and painstakingly, delivering expert information from Purdue University. Only by challenging convention could these men and women change the world. Enriching the Hoosier Farm Family beautifully illustrates their integral role in shaping the American experience.